Des Moines, Iowa – The Iowa State Fair and stock car racing has been a long-time tradition that still continues today. There is something extra special about going to the state fair and seeing the big Ferris wheel in the background, smelling the cotton candy and hearing the rumbling of engines. The Deery Brothers Summer Series for IMCA Late Models has been the latest tradition at the Iowa State Fair for numerous years now, usually playing to a near-capacity crowd on Monday night. From 1968 to 1975, the tradition was a little different. The auto racing program for the state fair was a Thursday afternoon matinee with super stock drivers and their cars coming together to see who was the best in the state. Appropriately named the Iowa State Super Stock Championships, this was as blue ribbon of an event as they came. The first state championship race, held on August 22, 1968, provided a thrilling finish as Joel Rasmussen of Ames passed “Big” John Moss of Iowa City on the last lap to take the win before a crowd of 6,500. Moss had held the top spot since the fourth circuit when early pacesetter Bud Darting of Wilton Junction collided with Bob Wignall of Rhodes, taking both leaders out and giving “Big John” the lead. Moss was comfortably ahead in the 25-lapper when carburetor problems on his 1957 Chevrolet started to slow him down with only a few laps left. Rasmussen, driving a 1960 Oldsmobile, sensed something was wrong with Moss’s car and started his charge, finally catching Moss on the backstretch of the white flag lap and winning by several car lengths at the finish. Rasmussen collected $450 for the victory while a disappointed Moss settled for $350. Bob Bonzer of Liscomb took third and earned $200, while George Barton of Des Moines took fourth, worth $150 and Stan Crooks of Letts rounded out the top-five finishers and took home $100. Bob Wignall, Bud Darting, Butch Householder of Algona and Moss won heats while Gene Schattschneider of Algona won the consolation. 1969 was shaping up to be Mel Morris’ year. The 35-year-old truck driver from West Liberty had been dominating the central Iowa racing scene that year; winning championships at West Liberty, Columbus Junction and Oskaloosa. The big half-mile at Des Moines had also been very kind to Morris in '69, so it came to no one’s surprise that he was the odds on favorite to win the Iowa State Fair Super Stock Championship race on Thursday, August 21. 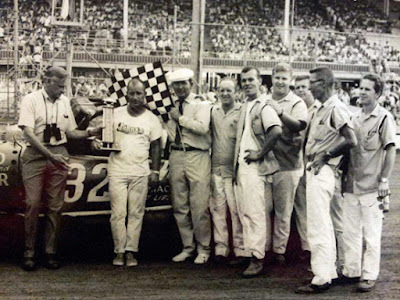 Driving a 1957 Chevrolet with a ’69 Hemi motor, Morris didn’t disappoint his supporters as he won the 25-lap championship before a sellout crowd of 9,500. Morris, who cashed in $450 for his winning efforts, didn’t run away from the field like most thought he would. After winning the third heat Morris started on the inside of the second row, and at the drop of the green flag, quickly moved into the second spot behind pole sitter Mark Mosier of Washington. For the next 18 laps, Mosier stayed up front with Morris dogging him the entire way. Morris never strayed to far from Mosier’s bumper during the race and on lap 19 he got the break he needed when Mosier developed wheel problems. Morris would slip by Mosier with defending State Fair champ Joel Rasmussen following Morris. Rasmussen would give Morris all he could handle for the remaining 5 circuits, showing his nose inside of Morris several times but couldn’t complete the necessary pass. Jerry LeCroy of Des Moines would take third place, Darreld Bunkofske of Algona took fourth and Bill Newman of Burlington earned fifth. Mosier would settle for the 13th spot. Mosier, Butch Householder, Morris and Rasmussen collected heat wins while Bob Bonzer took consolation honors. A total of 45 cars were in attendance and 24 started the feature. It’s called a dirt track, but the racing surface at the Iowa State Fairgrounds on Thursday, afternoon August 27, 1970, was more like a rough combination of concrete and glass. The super stock drivers found the “dry slick” that was formed under a bright sun and temperatures in the high 90’s lead one direction - into the fence at the top edge of the track. Many of the drivers, used to running the high-banked oval at night, appeared to have trouble adapting to the track and its condition. With the smaller degree of bank in the turns, and the sun making a tacky surface impossible, cars started hitting the fence and each other during hot laps, and continued throughout the afternoon. In the third heat it took five tries to get the first lap completed, and the race was halted several times during the latter part due to more accidents. The consolation also took nearly a half-hour to complete, as spin-outs and accidents brought out the yellow flag. Mark Mosier, who had see his hopes of winning the ’69 State Championship fade in the last few laps, overcame the difficulties of the racing surface to win the 25-lap event. Like Mel Morris did to him the year before, Mosier stayed glued to race leader Gene Schattschneider’s bumper throughout the contest and when “Schattsy’s” right rear tire shredded on lap 22, Mosier slipped by for the lead, where he fought off Joel Rasmussen the remaining three laps to take the victory. Rasmussen would settle for his second straight runner-up finish in the race with John Moss taking third, Butch Householder grabbing fourth and Ron Hemsted of Washington taking fifth. Mosier, Jim Havill of LeClaire, Rasmussen, and Don Hoffman of Des Moines were heat winners while Phil Reece of Des Moines topped the consolation field. No one would come close to Dan Dickey of Packwood in a game of follow the leader on Thursday afternoon, August 26, 1971. The 21-year-old driver had no trouble pulling away from the rest of the field in his 1969 Dodge Charger to take the $500 first-place money, trophy and title of Iowa State Super Stock Champion after dominating the 25-lap feature event. Driving on both central and southeastern Iowa tracks, the youthful chauffer had been no stranger to the winner’s circle. He was the point’s leader at Eldon, having won four features in a row. He had won features at Des Moines, Knoxville and Oskaloosa during the ’71 season. Once again, the August weather came into factor with the racing surface. Despite several waterings, the track baked under the hot sun and warm breeze, turning to a dusty, hard surface which made passing extremely difficult. There were several instances when cars moved up three or four places just through the attrition of cars ahead of them. There were numerous spinouts and minor accidents as the cars fought for traction. The battle for second, third, and fourth places was the main action in the feature, taking place far behind Dickey. Ken Davidson of Des Moines ran a steady second, but had a constant challenge from Denny Hovinga of Laurens and Red Dralle of Evansdale. Dralle did more passing in the race than anyone else would all afternoon long. He would scoot by Hovinga for third, make a move on Davidson, and then run into control problems on the dry track and slide back to fourth. 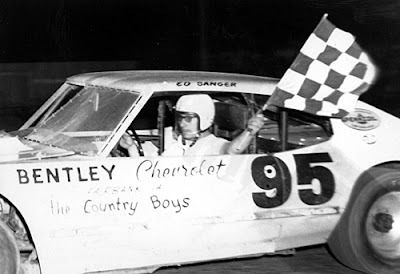 Late in the race Ron Hemsted made a strong bid for fourth, finishing neck and neck with Dralle as the checkers waved. The finish was so close in fact; the track announcer would not announce the results until the official scorers had made the decision. Ken Davidson, Del Stokke of Ames, Dickey, and George Barton of Ankeny earned heat wins and Phil Reece was the victor in the consolation race. 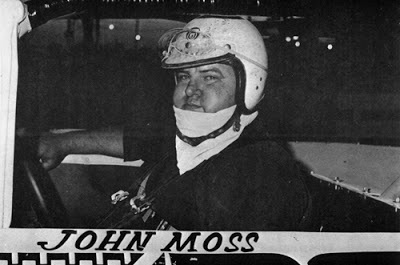 After seeing his chances of winning the 1968 race slip away on the last lap and despite putting together some good runs in others, John Moss had yet to see victory lane in the Iowa State Super Stock Championships and it frustrated the usually good natured driver. When he arrived at the state fairgrounds on August 24, 1972, John Moss made it very clear from the start; he wasn’t going to be denied this time. After dominating the second heat, Moss started on the outside of the front row and proceeded to throw his weight around in the 25-lap feature to run away from the field. The 300-pound pilot took over the lead early in the race and stayed there, although several yellow flags allowed the field of cars to pull up behind him. Moss picked up $500 for the feature win and another $30 for winning the heat race. The defending race champion, Dan Dickey, would put on another fine driving performance in taking runner-up honors while George Barton would earn a third place finish. Fourth through seventh place would take a little longer to figure out. Two drivers claimed that another driver had moved up illegally under a yellow flag, but the protest was shrugged off by race officials. John Babb of Ottumwa and Bill Lundington of Carlisle went to the officials of National Speedways, Inc., the promoter of the race, to charge Darrell Dake of Cedar Rapids had passed both of them and Stan Stover of Reinbeck under the caution flag. After being ignored by the National Speedways personnel for about 15 minutes, the two drivers attempted to make their complaint to the flagman Woody Brinkman of Lincoln, Neb., but as they started explaining the matter, Brinkman walked away from them without answering and the two drivers finally gave up. In the official standings, Dake finished fourth, with Stover fifth, Babb sixth and Lundington seventh. Bob Bonzer, Moss, Dickey and Barton would claim heat wins while John Meyer of Brooklyn grabbed the victory in the consolation. But things were looking much brighter to him after he won the 25-lap Iowa State Super Stock Championship feature on Thursday afternoon, August 23. “It’s unbelievable the car performed as well as it did,” the 31-year-old truck driver said after the race, which was witnessed by an estimated 7,000 fans. Jackson won the first heat with his 1973 Mercury Comet and, as a result, started the feature in the front row pole position. He grabbed the lead when the green flag fell and led for the first two laps. Darrell Dake, driving a 1972 Nova, had started beside Jackson. The lead see-sawed between them several times for the first few laps Then Jackson went ahead in turn two on the fifth lap and led the rest of the way. Dake, Lem Blankenship of Keokuk and Don Hoffman of Des Moines were eliminated because of an accident on lap 15. Blankenship, driving a 1972 Monte Carlo, was trying to pass Dake in the fourth turn when their cars smacked together. Both were sidelined. Hoffman, running close behind them, had nowhere to go and got into the melee. He also watched the remainder of the race from the pits. Cal Swanson of Reinbeck, in a 1968 Chevelle, and Stan Stover of Reinbeck, driving a 1978 Nova, finished second and third, respectively. Joe Merryfield of Des Moines was fourth. Jackson won $500, Swanson $400, Stover $225 and Merryfield $175. Jackson, Dake, Blankenship, and Swanson scored heat wins while Dave Bedard of LaPorte City, piloting a 1965 Chevelle, took top honors in the consolation. Bill Rice of Des Moines would walk away with the $500 first prize and capture the Super Stock Championship feature at the Iowa State Fair on Thursday, August 22, 1974. Rice guided his 1973 Camaro to victory in the 25-lap main event after also winning the fourth heat race. Bob Bonzer, who finished second in the first heat, claimed second in the 27-car feature while Joe Merryfield was third in a ‘74 Chevelle and Don Hoffman took fourth in a ‘72 Nova. Stan Stover, who started on the outside in the front row for the feature, quickly jumped into the lead in the second turn and led through the seventh lap, He was then forced out with a blown engine. Bill Martin of Des Moines, who won the first heat and started on the pole for the main, was running second when Stover left. He held the lead until he spun out on lap 17 and left the race. Martin's spin caused a yellow flag and when the race got under way Rice took the lead and never lost it. Rice started in the fourth spot for the feature, but never was any farther back than third place. In addition to Rice and Bonzer winning heat races, Bill Martin and Ron Hemsted of Lone Tree also scored heat victories. Rex Carter of Adel won the 10-lap consolation. Ed Sanger of Waterloo and the Iowa State Fairgrounds track had proved to be a winning combination in 1975. 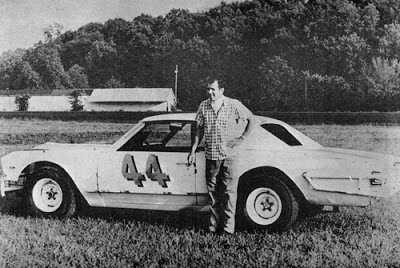 Sanger, who had won two of three starts at the half-mile oval that year (he finished second the other time), found the track to his liking again as he captured the Iowa State Super Stock Championship on August 21, 1975. Sanger, who also won the first heat, took the lead on the eighth lap from second place finisher John Connolly of Delhi and stretched that margin to six car lengths at times even though two accidents allowed the field to close up again. Mel Morris finished third, followed by Lem Blankenship, Don Hoffman and Ron Tilley of Council Bluffs. One of the delays in the 25-lap feature came on lap 13 when defending champion Bill Rice smacked the wall extremely hard in his 1973 Camaro and clipped a car driven by Larry Rummelhart of Riverside. The impact of the crash caused Rice to spin in the air and tore the rear end of the car completely away from the rest of the body as flames momentarily shot from underneath. Sanger, the season point leader at Denison and Davenport, only had one complaint after the race – “a splitting headache” caused by the high temperatures. Bob Hilmer of Dysart, Sanger, Ron Weedon of Pleasant Valley, and Connolly were heat winners. Ron Prymek of Des Moines and Perry Beckler of Iowa City staged a two-man battle in the consolation with Prymek coming out on top in his 1975 Chevelle. As the saying goes, “All good things must come to an end” and so would the Iowa State Super Stock Championships. 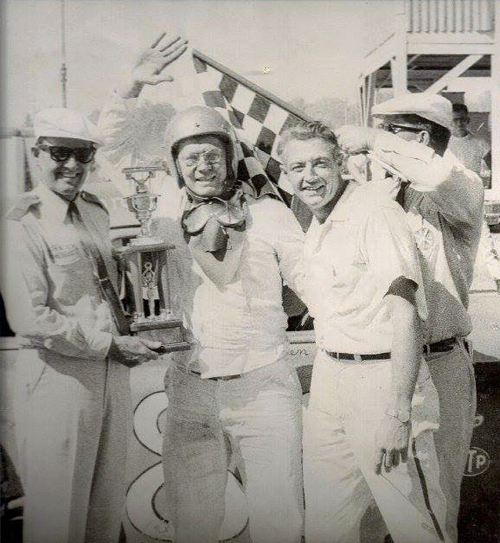 In 1976, the Thursday afternoon tradition of championship super stock racing would be replaced with sprint cars. Thanks for posting this Kyle. As you know I grew up watching, Mark Mosier, Johnny Moss, Mel Morris, Ron Hempstead, Stan Crooks, and Bud Darting all race each other at Columbus Junction and West Liberty. Great racers they all were!